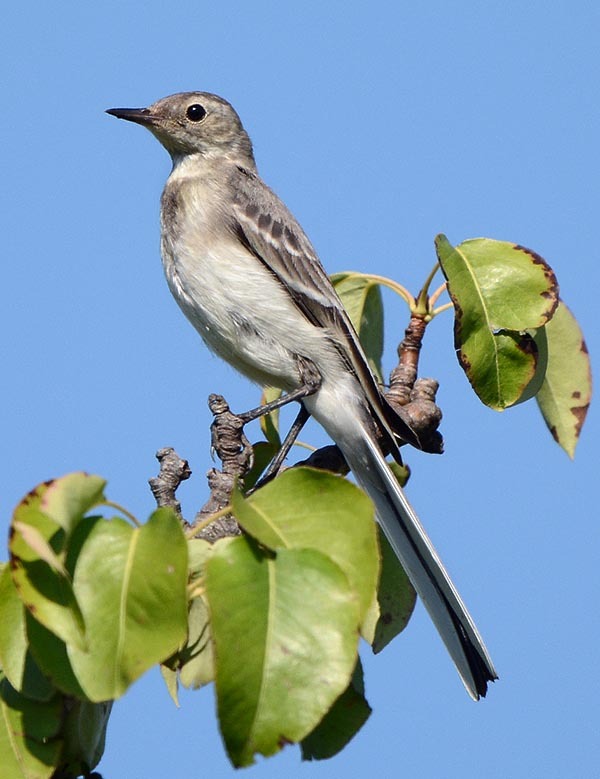 The White wagtail (Motacilla alba – Linnaeus, 1758) is a nice and gay small bird, very active and restless, belonging to the order of the Passeriformes and to the family of the Motacillidae. Very similar to the two congeners, the Grey wagtail (Motacilla cinerea) and the Yellow wagtail (Motacilla flava), with whom it shares habitat and most of the territory, is however basically of different colour so much to be called commonly also white and black wagtail. Anyway, there is a behavioural character strictly in common and that renders them rather similar and unmistakable: the tail. Very elongated in all three species and continuously shaken at each step, at each bow or even when perched on some small branch or a simple furrow just raised from the ground. Then, all three know how to run very fast with rapid shots of a few metres or small hops just to catch a small insect staying on a blade of grass or a midge that recklessly flies over them. The white wagtail is a terricolous spending most of the time scratching and grazing on the soil looking for insects, but its walk has something of special, wags its tail, hops, moves in short, quick steps then stops, a short turnaround of one second and then again wiggles sensually like to the beat of a music it alone can hear. Then, not satisfied, here it is making a very short race and taking off with a light and undulate flight, unfailingly accompanied by the traditional “zizzip zizzip” perfectly rhythmic and cadenced with its aerial dance, just no to deny its innate class also when flying. Its elegance is beyond doubt and the name of ballerina (dancer) given by the Italians is by sure well-suited even if also those given by some European nations are also fairly folkloric though not giving it the merit of the elegance. We go from the French calling it Bergeronette grise, coddling it with a shepherdhess due to its habit of walking among the flocks, to the Germans Bachstelze – brook stilt – for its habitat preferences, to the British White wagtail – the one who wags the tail, to the Spaniards Lavandera Blanca and the Portuguese Alvéola-branca who limit to describe its colour, and finally the Italians, Ballerina bianca or Coditremola. 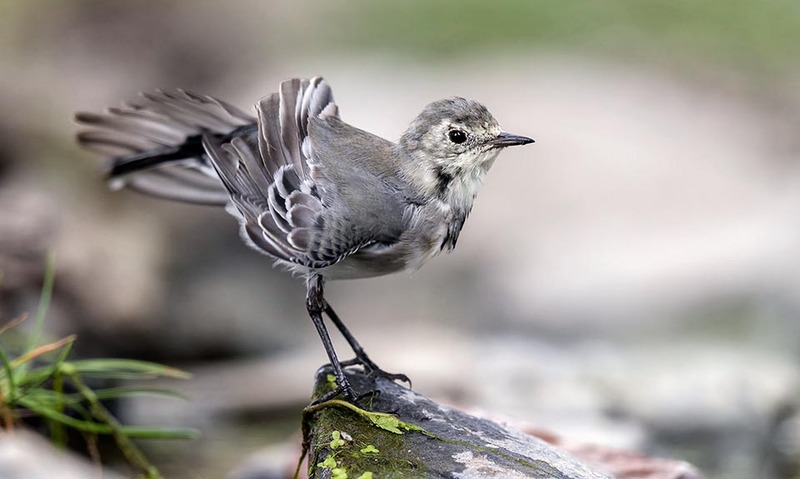 However, these kind and delicate characteristics should not suggest a weak or helpless small bird, as the white wagtail displays, on the contrary, an incredible strength of adaptation and of resistance to the worst environmental and climatic conditions, situations at times unthinkable. In fact, it can live indifferently in the unbearable climate of the Bering Strait or in the middle of a fiery desert, in the bustle of a city or in a high mountain desolate land. It is a very common bird and even if linked to open and also wild spaces, it is often met also in the rural settlements, between the farmhouses, in the industrial areas, in gardens or in any other environment even if not strictly linked to water streams, element that however results unmissable in its life. Its distinctive character of sociability leads it to often coexist with the human being, getting used to his presence and becoming fairly docile and reckless. It is not rare to see it pecking crumbs out of the front door or walking on our roofs looking for insects and also seeing it gathering in groups, important at times, to spend the cold winter nights leaning against our dwellings to enjoy the warmth. In this regard, the Irish love to remember the thousands of wagtails that in winter gathered in the tree-lined avenues of Dublin and the British of Leicester that of the flock that met in the evening on the stained glass windows of the city post office. It is no less their adaptability for the nesting. Always the British news bulletins of a few decades ago, referred of a nest of wagtail placed on the fender of a car that every day was parked in front a school and that the couple of birds waited regularly all the mornings for continuing its construction. The etymology of the scientific name has a derivation immersed in the whirlings of the imaginative speculations of yore. The name of the genus Motacilla should come after some from “motare” = to wag and “cilla” a Medieval linguistic invention to indicate the tail whilst for the more founded interpreters should come from the Greek term “muttex”, name used by Hesychius to indicate these small birds. 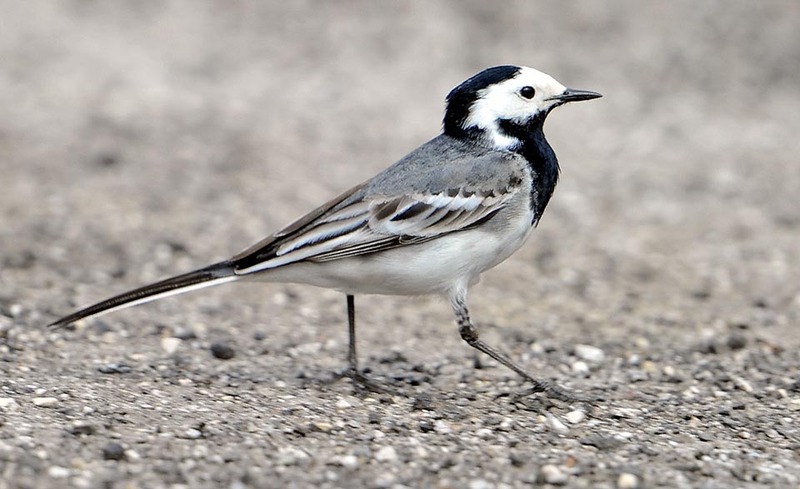 The specific name alba from the Latin white, the colour that distinguishes it at first sight from the other Euro-Asian wagtails. There is no climate or area, though uncomfortable, that does not have its population of white wagtails. The area occupied by it during the nesting period, is limited north by a line that from the eastern coasts of Greenland through the whole Scandinavia, Novaja Zemlja, the northern coast of Siberia reaches the coasts of Alaska. South, from the European Mediterranean coasts through Anatolia, Iran, all area north to the Himalayan chains up to all continental China. It does not nest only in the Indian subcontinent and in the Indo-Chinese peninsula. It is also present in Africa, limited to Morocco only. In south Europe it oddly presents some regions without populations, such as Sardinia, Corsica, the French Mediterranean coasts and some areas in the southern part of the Iberian Peninsula. In continental and Mediterranean Europe the species is mainly sedentary with a winter overlapping by part of the arrival of the oriental and septentrional populations that are, instead, migratory. These migrations reach the sub-Saharan area and the Arabic peninsula and Middle East whilst the Siberian and continental Asian populations take refuge in the bad season south of the Himalayan chains in the tropical areas of India and Indochina. 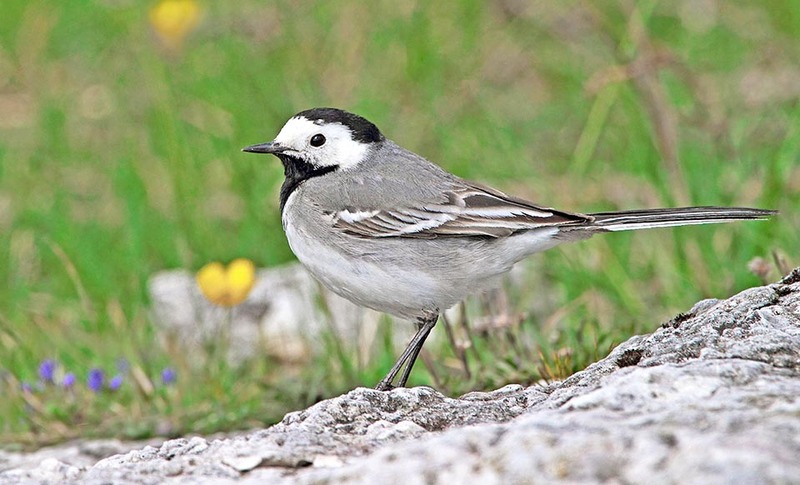 As we shall see, the white wagtail has various subspecies remained in these levels, others reinstated by many, in recent times, as self-standing species and others still classified since immediately as autonomous species even if almost indistinguishable from the holotype. A still evolving time. The white wagtail is a very common species and punctually diffused in the whole occupied range. Even if never in important number, being a social species only in the roosting, it can be unfailingly found in any suitable place or where it has wanted to settle, seen its great capacity of adaptation. We usually find it near water streams, rivulets or even backwater, gravelly riverbeds, cultivated and plowed fields, edges of roads, fresh lawns but essentially on rather bare lands that can give it the possibility of walking freely with no difficulty. It goes up in the mountains up to 2000 m occupying the mountain grasslands and their babbling brooks, the Alpine huts and the pastures and reaching the timberline. It does not love woods and forests or densely treed areas. In the mean time it may accept absolutely arid lands, towns, industrial zones, farmhouses but always with the possibility of having available, not far away, the unmissable water. It adores following the flocks and the grazing cattle, walking among them to catch some insect moved by their passage. This habit has granted them the Italian Padanian name of “boarina” and “bovarina” or “guardapecora” and “parapecora” (warden of the sheep), rightly for this innate habit. As well says the name, the basic colours of this motacillid are the white and the black. These colours are more or less present or in evidence in the livery of the various classified subspecies. The considered basic species, the Motacilla alba alba, specifically European and of Asia Minor, has a pure white mask covering front and cheeks, with a very black hood going down up to the nape. The throat is covered by a raven black gag descending on the chest that is totally candid up to the undertail whilst the shoulders and the coverts are ash grey streaked by white alar bars and by coverts with barbs also white that in flight clearly evidence the bicolour look of the livery. Very black eyes that evidently stand out on the very white mask and are well visible even from far away. Bill and legs are black pearl. The tail is remarkable and represents about half of the total length, black above with white outer remiges. The female is not much distinguishable if not from the black slightly more opaque and less bright. The youngs have a livery missing of the black accentuations and are usually all greyish so much to make them appearing another species and much confoundable with the peers of the above named congeners. Also the adults during the winter moult lose many of the characteristics of contrast of the white black on their livery, usually becoming more greyish with a strong attenuation of the breast band and of the black hood. Many subspecies have been classified among which the Motacilla alba yarrellii typical to the Anglo-Saxon area where it lives and that shows a bigger quantity of black on the head having the under throat band connected with the hood. 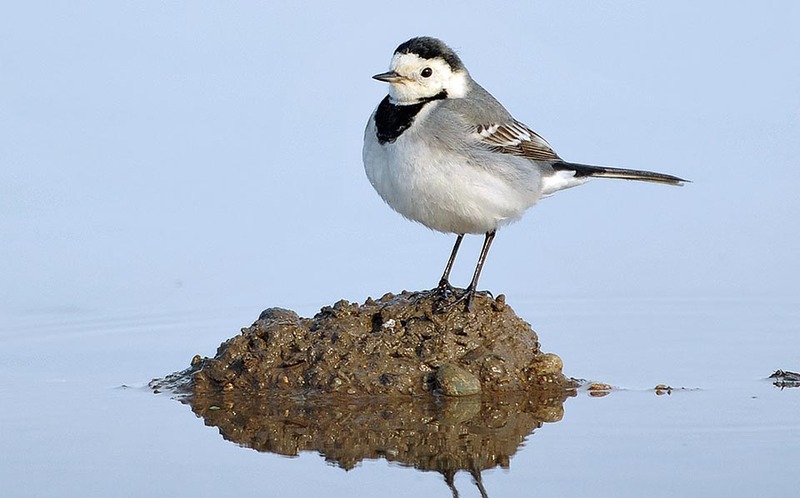 Many consider it as self standing species and the British themselves have given it the common name of Pied Wagtail to distinguish it, rightly, from the White Wagtail. 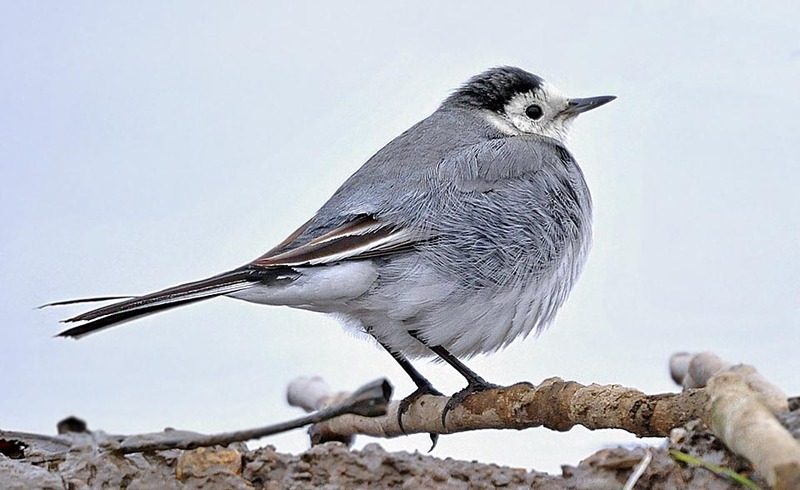 The Motacilla alba subpersonata of Morocco, the Motacilla alba personata of Central Asia, the Motacilla alba dukhunensis of the Uralic and Caucasian areas, the Motacilla alba leucopsis of Mongolia and China, then the Motacilla alba baicalensis, the Motacilla alba lugens, the Motacilla alba alboides, the Motacilla alba persica and the Motacilla alba ocularis. 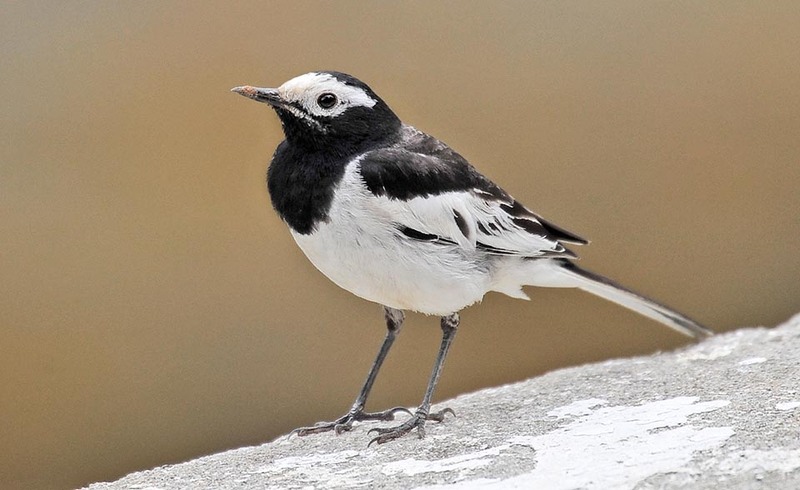 Conversely, Africa is inhabited by very similar species such as the African pied wagtail (Motacilla aguimp), the Mountain wagtail (Motacilla clara), the Cape wagtail (Motacilla capensis), specimens that often result indistinguishable even among themselves. Asia is not behind with the White-browed wagtail (Motacilla maderaspatensis) and the Forest wagtail (Dendronanthus indicus). The dimensions are almost the same for all and are of about 18,5 cm of length, weight of 20 g and a wingspan of 27 cm. 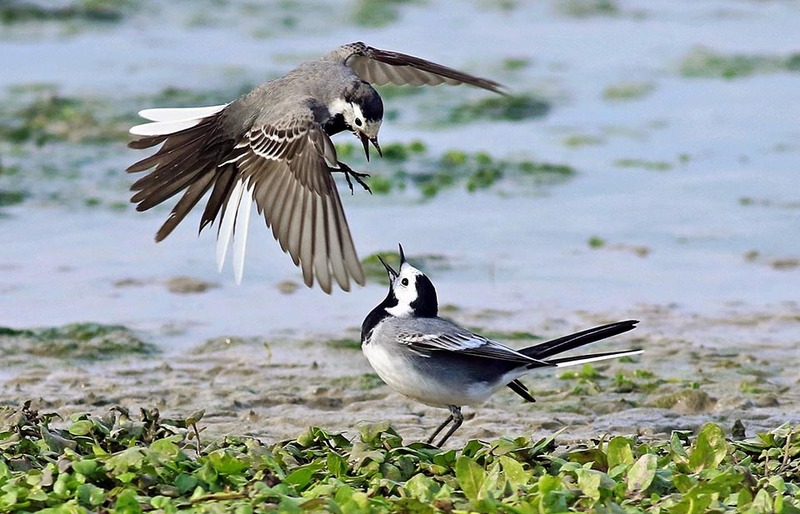 The white wagtail, in the southern part of its range, may lay eggs even three times per year. It is a monogamous bird that couples for only the nesting season. There is not a precise place where it can nest as practically takes advantage of any site that offers the least conditions for giving a shelter to its structure. It can be under the vault of a bridge over a stream, between the roots of a trunk facing the water stream, between the beams of a hut, under the tiles of a roof of a house, on an escarpment, in a natural or artificial crevice, in a hole of a wall, practically everywhere. 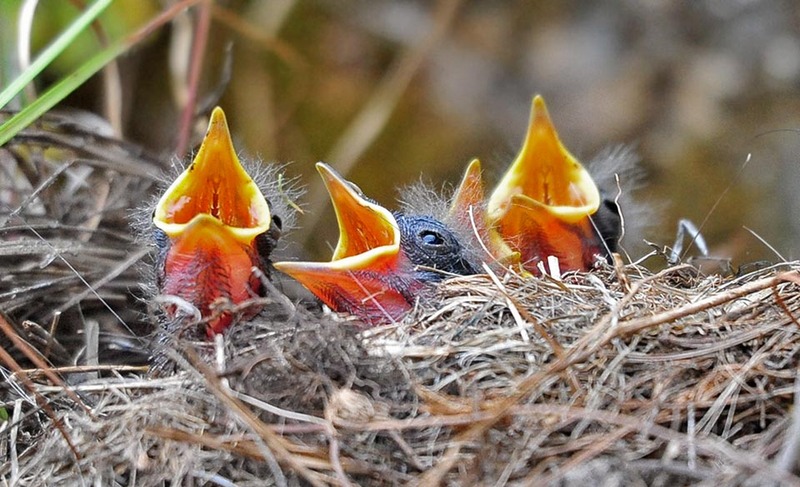 The nest is a mass of small dry grass, moss, wool, feathers and very thin rootlets that fills up and wraps wholly the cavity or a simple platform with central cup when located in a more exposed place. 3 to 6 whitish eggs are laid, finely spotted of grey that are brooded only by the female for a relatively short time of about 12-14 days. The small nestlings come to life featherless and blind and keep in the nest for 2 weeks more lovely cared by both parents. At the first flight they do not yet show a length of the tail up to their name but soon it will start to grow till when it will reach, in short time, the usual size typical of the species. 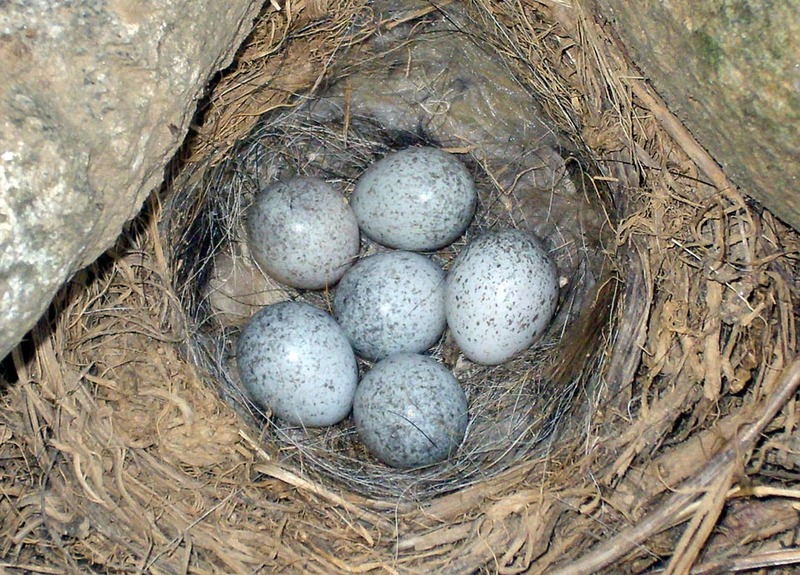 The nest is occasionally used again for a following deposition. 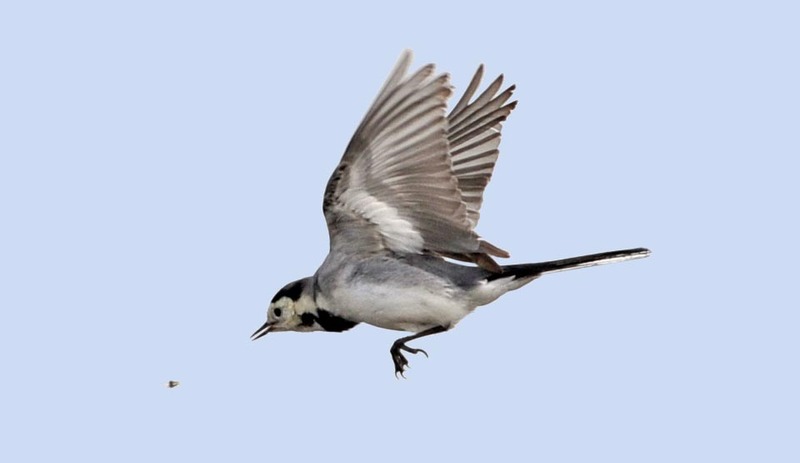 The white wagtail is by far an insectivorous bird even if in winter it deigns to peck anything to survive. In this period it is not rare to see it running hastily on the supermarkets yards among busy people and shopping trolleys and then taking off, for the truth not at all alarmed, due to the arrival of the first dog. More than anything else it loves flying insects that catches on the wing with an unthinkable mastery. Also when on the ground during its continuous runs and walks does nothing else than to raise in flight midges, mosquitoes, dipterans of every kind it seizes with incredible rapidity as soon as they take off from the blades of grass where they were staying. It does not disdain larvae, caterpillars and earthworms but its specialization is focuses on the flying ones. Very often it is seen doing short flights over the surface of the water just for the pleasure of catching a careless ephemeral that flies over and repeating continuously this scene, even if with no success or without a precise aim, as if that dance would rejoice it and would remind us that actually it is a virtuoso dancer.